In this tapestry of personal anecdotes interwoven with the wisdom of her humble and respected philosophical mentor, William Samuel, Sandy Jones shows us her own personal journey of discovering the child within. Through stories of her childhood in California, to her life falling in love and raising a family in Aspen and back to California again, we are taken on an intimate tour of the joys and heartaches of living and the power of trusting in what is innate and true in each of us. We discover the wisdom of the child-like spirit seen through the eyes and experience of one who embodies that very spirit. With Sandy as our guide and William's words strung throughout, we remember what it feels like to be free and unafraid, like children running through sprinklers barefoot and laughing and falling down and laughing again. Barefoot at Heart is at once an autobiographical narrative, a conversation with life, a glimpse of a philosophy lived, and a love letter to the great mystery that holds us all. Sandy takes us on a secret path she has forged, past the huckleberries, through the brambles and into the wide open field of our own sweet hearts, and whispers that we can go there any time we like. And we pause, and look around and feel a new freedom and say, like Celeste from Sandy's own childhood record, That's the place for me. You are not finished, until you play in that meadow and live there. You can, you know. But only you can take yourself there. This is just so beautiful. I keep getting these most wonderful reviews of my book - I've got 18 reviews on Amazon now and they are all 5 stars. This one, I am posting here, is really a little gem too. Oh they all have been so precious to me. Thank you. You see, I heard the angels say to me that I had to write this book and publish it. Then, they said to just let it go and watch the magic. So I did that. I did my part. And I see my sweet, divine Universe is carrying everything else along for me - This Child heart of mine knows how to navigate this world. What a sweet joy Life is- the profound mystery just thrills my soul. Barefoot At Heart Touches The Place Within Where Words Can't! Barefoot at Heart by Sandy Jones touches the place within where words can't. The essence of this book is Joy and Love for Life itself. The free and untamed beauty Sandy is, is reflected through her spontaneous writings. The book doesn't follow the traditional story structure (linear events) and that is the pure Divinity of it - each page is filled with the source of the ever-renewing Child. This means that every time you read and re-read a word, a sentence, a passage, a chapter or the whole book again it is always wonderfully new and confirming to the Child within us all. This book filled my heart with the Child which has been lovingly waiting recognition of Itself. Sandy is living this Truth and is William Samuel's messenger sent to carry the timeless message of our true Identity. There is no guidelines to Truth in this book just Sandy's experience of the sweet and gentle song of Life that is always there if we just listen. Can't wait to read this book again and again! This book is written in a rather unusual way. Now, if you need something more intellectual than this pure light from the heart of the Child, then this book might be a bit perplexing. I know it was an unusual book. But, i really very intentionally wrote it the way I did so as to allow others to be brought right here into this sweet place and feel the powerful depth of this Living Presence that the Child is directly in touch with. That may throw a lot of people off, if they are only seeking concepts and ideologies - My book is not written to or for the those who want instructions. This book, "Barefoot at Heart" is different. i know that. I am absolutely delighted that it is. Because the Living Light does not conform to dogma or reason. It can include those things, but it does not Live as those things. I did something quite extraordinary and marvelous. Someone has to do this way, and open the doors for others to walk in, if they want to -- so I guess I was the one. Although, I certainly did lead the readers to William Samuel if they want guidance and if they want to find what I have found, he has done a marvels job of leaving us the keys and he shares these ideas brilliantly. He makes it all accessible to the intellect and touches the heart too. My joy is always to let others know of his work. As it was his way with teaching that lead to home to my self. Glory be. Anyway, I hope you read it. I think many of you will your way to real and authentic freedom as you reclaim your true Identity and the unbound joy of being who you are because of this book that I wrote. It's a divine gift from many Lights who conspired with me to share this the way I did. 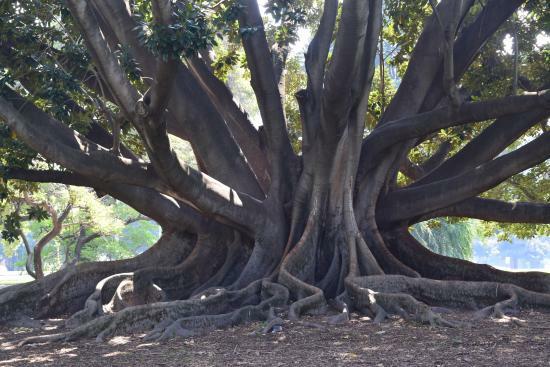 Even your prose above reminded me of the joy I had stroking a beautiful young Moreton Bay Fig --- so much joy I had to take a friend to come and stroke it too It will (eventually) grow up to be like this one. Hey Jen, thank you so much for the very lovely note to me. Awww, I like that. and I love that tree. I've never met a Morton Bay Fig. but she looks gorgeous and I bet she feels so fine Sweet that you can sense the profound wonder that permeates this mystery of life we are experiencing. Yes, my book is rather 'sensual' - but for me, that was the only way I could communicate what I am seeing, feeling, touching here as I live in this world of tangible matter. I know the Love that is behind the images and I want to find a way to crack a little opening, if only for a moment, in the hearts of those who are willing to reclaim their true Selfhood. They can, and they will. Truly it is as the man from Galilee knew ( and got so used and misunderstood, but I guess that too is as it was meant to be ) he said that the he Kingdom, Eden, Heaven, God's presence is spread over the face of the earth and no one is seeing it. For me it was a matter of finding my self, and then in that Self discovery I became fearless, Yes, I was amazed. and here I hold the hand of my real self, the pure Child of me, and then daring to be her and live her light here in the world, as I lied it, this world began to 'morph' or slip ever so easy, gently into a third few, where both duality and non-duality ( infinite mind and tangible matter) became one, one single one, just as I had become whole, complete and real. What I found became what I live and know. I love this world, this whole entire experience of Life. I saw from the Mountain top, but I had to come back down into the world and live again. This time, fearless, because I know things are powerless and there is no death. - ahhh yes. This that I have been given to see, it simple and easy. It is all about the Child as my friend William Samuel says. He was right. And it is amazing - yes, and wonderful. I have to do what I do now, because I am filled with love and love cannot be less than this beauty that it is that has found me. and I know others are finding this too. I want to, at least, know that I did what I was supposed to do while I was here. Writing that book was required.